You have the right to remain silent. 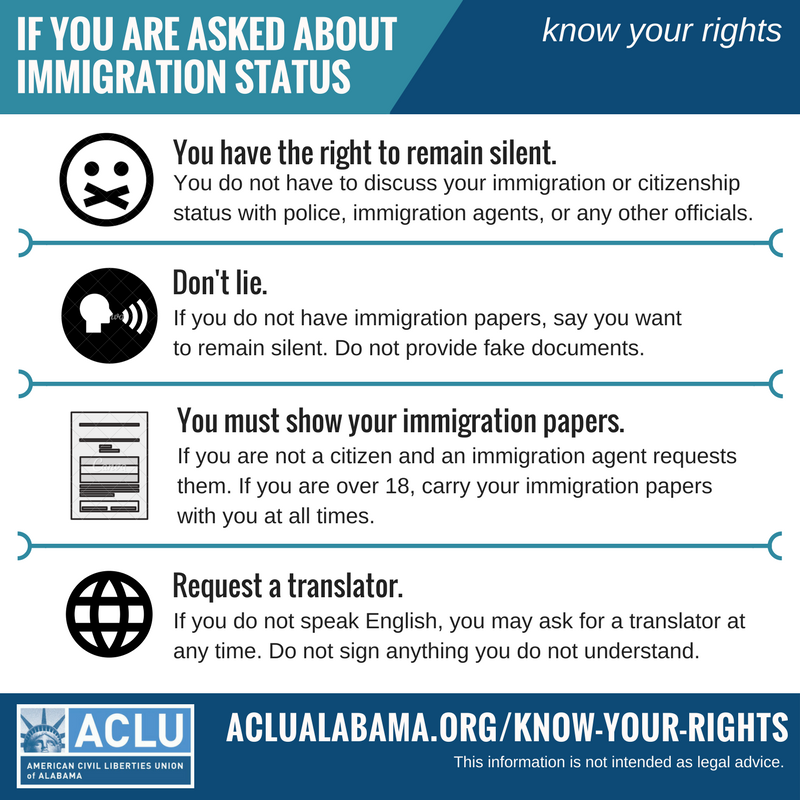 You do not have to answer questions about where you were born, whether you're a US citizen, or how you entered the country. If you're not a US citizen and an immigration agent requests your immigration papers, you must show them. If you're over 18, carry your immigration documents with you at all times. If you don't have immigration papers, say you want to remain silent. Stop the car in a safe place as quickly as possible. Turn off the car, turn on the internal light, open the window part way, and place your hands on the wheel. Upon request, show police your driver’s license, registration, and proof of insurance. If an officer or immigration agent asks to search your car, you can refuse. But if police believe your car contains evidence of a crime, they can search it without your consent. Both drivers and passengers have the right to remain silent. If you’re a passenger, you can ask if you’re free to leave. If yes, silently leave. Write down everything you remember, including officers’ badges and patrol car numbers, which agency the officers were from, and any other details. Get contact information for witnesses. If you’re injured, seek medical attention immediately and take photographs of your injuries. File a written complaint with the agency’s internal affairs division or civilian complaint board. In most cases, you can file a complaint anonymously if you wish. What can I do to help with family separations right here in Alabama?